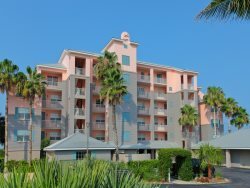 Gasparilla Vacations | Boca Vista Harbor 3 bedroom 2 bath end unit condo with overlooking the waters of Coral Creek. Lush tropical landscapes and gorgeous views of the water don this end unit condo in Boca Vista Harbor. Come stay in this 3 bedroom, 2 bath condo that has over 1700 sq. feet of luxurious living space. This stunning 2nd floor unit boasts fresh and modern décor with tropical touches throughout, designer furnishings and rich wood finishes. The living and dining area offers ample seating, perfect for entertaining. The open concept connects the kitchen to the living area and screened-in balcony giving the space a bright and spacious feel. The master suite features a king size bed, large windows offering views of the water, and sliding doors granting access to the expansive screened-in balcony. The magnificent master bath is spacious and has his and her sinks, a walk-in shower, and large soaking tub. The second and third bedrooms are equally impressive offering coastal furnishings and accents, plenty of natural light, and closet space. This private gated community of Boca Vista Harbor offers a heated community pool for your enjoyment, tennis courts, and grills. It is located on the scenic Cape Haze peninsula, and is just minutes to the white sand beaches of Boca Grande. For the outdoor lover Pioneer Trail is located just across the street allowing you to enjoy 8 miles of walking and biking trails at your leisure. Book today and find out why Boca Grande has become one of the most desirable vacation destinations on the Gulf Coast! 225 square feet of private covered and screened outdoor space with sitting area overlooking a spectacular water view. Towels, bedding, and most home amenities. We rented condos in the Keys for 15 winters and never worked with anyone of Rob's ability and quality. he is exceptional. The condo, the larger property, the location and working with Rob Domke were all exceptional. It is a good, well equipped and well furnished condo which was perfect for our needs. My wife is somewhat handicapped. The condo was safe and easy for her to move about and very convenient from the parking lot. In most condos we have rented over the years, we have really wanted to get home to our own mattress. This year was the opposite. Leaving the beds in 205 and coming home was a let down. Most importantly, working with Rob Domke was a very positive experience. He is very good at what he does and took care of us an our needs extremely well. We highly recommend this property! It had everything we needed for amenities and space. Onsite pool and hot tub, gas and charcoal grills to use, boat rental and bar/grill next door, two fishing piers and live bait purchase within walking distance, short drive to Boca Grande, and a grocery store just up the road. This rental worked well for our family of 4 with middle schooler and high schooler. Rob was very responsive pre-trip and during our stay. We would come back in a heart beat. Welcome to Boca Vista a luxury waterfront condo complex located just off the island of Boca Grande.